Exciting things happen when you wander around New York City and, yesterday, one of those things happened to me! 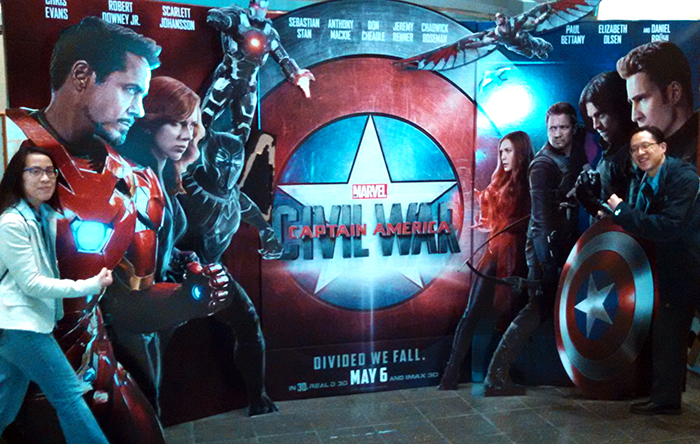 I was running errands around the city when a promotion team stopped me (admittedly, when my face was down in my phone) to hand me a ticket to a special advance screening to the newest film from Marvel Studios… Captain America: Civil War! Advance screenings are promotions for new films, a studio’s marketing strategy to generate word-of-mouth advertising and build hype. I learned that, at the screening from last night, a large number of tickets were awarded through contests (radio, sweepstakes, etc); others were presented to loyal fans of Marvel, Walt Disney, or movies in general; still others were distributed by street promo teams similar to the ones we often see here in bustling New York; and, finally, some were given to critics and press. 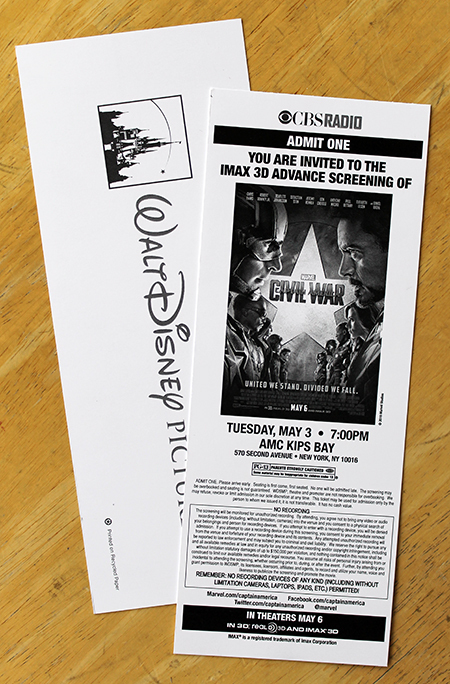 The advance screening was shown in IMAX 3D at AMC; my ticket was sponsored by Walt Disney Pictures and CBS Radio. 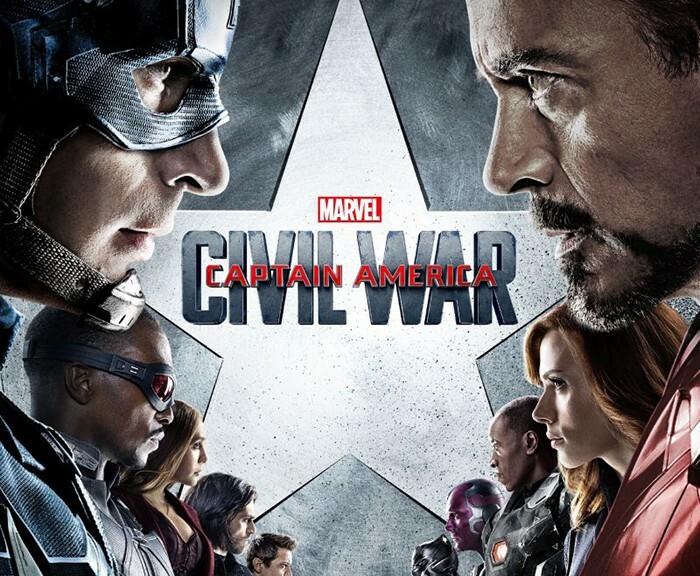 Captain America: Civil War is the 13th and the newest feature film of the Marvel Cinematic Universe. The Universe itself is an absolute genius multimedia business approach, a corporate innovation, and the brainchild of the Marvel Studios president, Kevin Feige. Of course, like other traditional movies, Marvel’s feature films spawn a marketing campaign including merchandising and sequels. However, what is spectacular about Marvel’s economic strategy is that the films also serve as an anchor for what has become a colossal commercial endeavor that is much, much more. Marvel has created an elaborate web, world, and – indeed – universe that intertwines characters, settings, story lines, all of which allow the exponential expansion of the franchise into comic books, short films, attractions, commercials, etc. For example, the feature films feed and are fed by major TV shows including Agents of S.H.I.E.L.D. on ABC, Daredevil on Netflix, and others. In terms of business, the interweaving of characters and story lines means automatic cross-promotion for the different elements of the Marvel franchise. In terms of fandom, the crossover paves the way for elaborate plots and complex personas that are constantly developing; exciting anticipation for the revelation of new characters and events; and overall good entertainment. Marvel’s megafranchise is now the leading giant of entertainment, setting the cinematic standard which other companies are trying to achieve, albeit somewhat less successfully (read: X-Men). It’s become known as “the Avengers effect.” I’m certain that Marvel’s impressive storytelling and marketing strategies are an important contributor of the impossible – making geek and nerd culture mainstream. All of a sudden, it is cool to like superheroes! By the way, a couple of years ago, Bloomberg Businessweek published a fascinating chronicle on how Marvel started out as an underdog and is now is a multimedia behemoth (read it here). True to its reputation of interlocking, the highly anticipated Captain America 3 touts a cast list of giants – both in terms of the fictional comic book personalities and the real-life movie stars who play them. There was the return of our favorite characters already established in the Marvel Cinematic Universe: Steve Rogers AKA Captain America (Chris Evans), Tony Stark AKA Iron Man (Robert Downey, Jr), Sam Wilson AKA Falcon (Anthony Mackie), Bucky Barnes AKA the Winter Soldier (Sebastian Stan), Natasha Romanoff AKA Black Widow (Scarlett Johansson), Wanda Maximoff AKA Scarlet Witch (Elizabeth Olsen), Vision (Paul Bettany), James “Rhodey” Rhodes AKA War Machine (Don Cheadle), Clint Barton AKA Hawkeye (Jeremy Renner), Scott Lang AKA Ant Man (Paul Rudd), and Sharon Carter (Emily VanCamp). There were also exciting introductions of personalities known to old-school Marvel comic book lovers but not to the modern Marvel big screen: T’Challa AKA Black Panther (Chadwick Boseman) and – perhaps one of the most highly anticipated characters to enter the Universe – Peter Parker AKA Spider-Man (Tom Holland)! Speaking of highly anticipated introductions in Captain America 3, the incorporation of Spider-Man into the Marvel Cinematic Universe is an interesting agreement between Sony and Marvel. Spider-Man is possibly the most iconic superhuman created by Stan Lee and it seems unusual that one of the most beloved Marvel characters is absent from story lines; however, Marvel could not incorporate Spider-Man into the Universe because it sold the rights to Sony way back before multimedia megafranchises were a thing. That is, until now. After less than impressive performances of Spider-Man movies, Sony has decided to reboot the character. The way they are choosing to do so is to ride on the fandom and following of Marvel Studios. For a grand total of zero dollars, Marvel Studios can use Spider-Man in their films, satiating fans by giving them one of their biggest superheroes. In return, Sony will build their own standalone Spider-Man franchise upon the rehabilitated character personality introduced in those Marvel films. As Sony retains all rights, it will benefit from the solo Spider-Man features which are set to begin in 2017. Surprisingly, I did not feel that Spider-Man’s inclusion in Captain America 3 was contrived, and his appearance fit well in the plot. However, the new Spider-Man is a teenager… blah. Spider-Man is one of my favorites and I like idea of a Peter Parker who, similarly to other young adults finding their way, is constantly striving to establish an identify for himself – in school, work, family, romance, and in his immensely complicated superhuman role. The rebooted Spider-Man is also intended to be relatable but now it is to a younger audience with growing pain challenges – none of that appeals to me individually (read: I think I’m getting old). Even though I’m not an immediate fan of the new Spidey, it will be interesting to see how Sony (and Marvel) develops the character. In this Marvel film, Peter films Spidey and uploads the videos to YouTube, rather than photographing him for publication in J. Jonah Jameson’s Daily Bugle (really?!). I’ve never attended an advance screening but if I had a choice for what would be my first, it would indeed have been Captain America: Civil War! Even with the laundry list of characters, the plot was forward-moving and each individual played an important role. I would expect nothing less from Marvel than the excitement, action, and great visuals provided. The story line was straightforward enough for a standalone to be enjoyed by a first-time Marvel viewer; it was complex enough for development to appease the loyal fan. I highly recommend it! Lucky you, Kathy May …… but wondered whether it would happen in Boston ??????? Hmm… My understanding is that advance screenings usually occur in large cities (NYC, LA, ATL, etc). I’m not sure if Boston qualifies as a large enough city – I’ve certainly never seen promotion teams roaming around, whereas in NYC I’ve seen it fairly frequently.